What is the change in momentum of the center of mass of the system as a result of the collision? This is College Physics Answers with Shaun Dychko Let's calculate the momentum of the center of mass of the system. Initially we have puck B which is at rest and we have puck A coming in to collide with it at some velocity vA and we have a center of mass which is approximately here and we'll take that to be x equals zero. It's a bit closer to B than it is to A since B is more massive. We can find that position x by saying that it's the mass A times the position of xA plus mass B times position xB all divided by the total mass. This is the center of mass formula. Well, that's all well and good but what we're really interested in is the velocity of the center of mass and then we can multiply by the total mass of the system to find its momentum. So let's divide both sides by t. If we divide this side by t we can instead divide each term by t, and we can see that this velocity of the center of mass which is what x over t is -- we'll say c m for center of mass -- equals mass A times the velocity of A because that is what xAover t is, plus mass B times velocity of B, all divided by the total mass. Then, to find the momentum multiply this by the total mass and we get the momentum of the center of mass. So we're going to calculate this momentum before and after the collision. That's going to be mA vA plus mB vB. Now, before the collision we have vB at rest and mass A is 0.200 kilograms or 200 grams multiplied by eight meters per second. This works out to a positive 1.6 kilograms meters per second. So that's before. Now, let's find the momentum afterwards. The momentum of the center of mass, say prime, after the collision, we're going to have 0.200 kilograms multiplied by negative 2.0 meters per second now and add to that the 0.8 kilograms mass of puck B multiplied by its positive two and a half meters per second velocity. This works out to 1.6 kilograms meters per second as well. 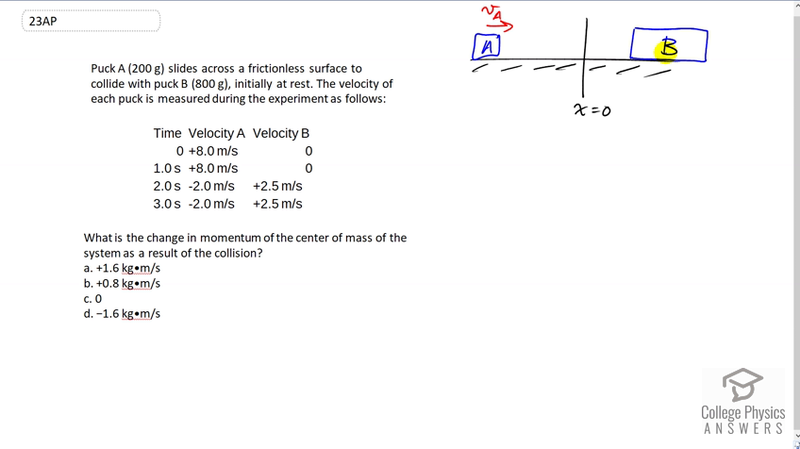 So the answer is C. Now we could have stated that without doing any calculations actually because since this is a closed system and there is no external forces acting on it, the total momentum of the system is going to be unchanged by the collision and that also means that the momentum of the center of mass is not going to change because there would need to be a net external force in the system in order to change the momentum of the center of mass. So the answer is definitely C.